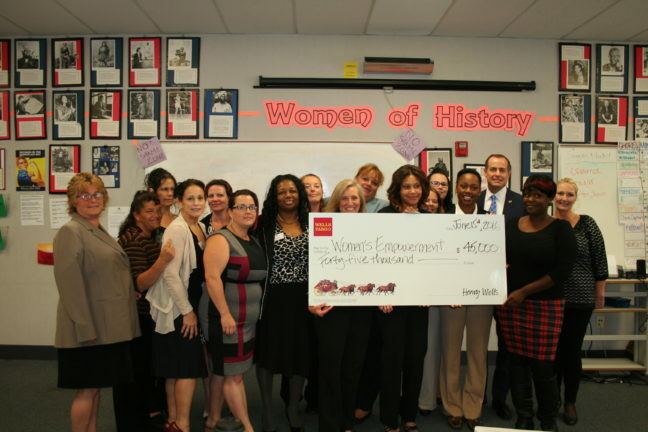 Wells Fargo & Company recently granted $45,000 to Sacramento nonprofit Women’s Empowerment for job training for formerly homeless women through the group’s Get A Job Kit Training, which provides paid stipends to participants. Funds also will support Women’s Empowerment’s on-the-job training in customer service and office administration, as well as transportation in partnership with Paratransit. Women’s Empowerment launched The Get A Job Kit Training with the help of Wells Fargo in 2014 to train women in the production, customer service, shipping and receiving industries. The program includes four-week paid training sessions with education and training in the field, assembly instruction and work with employment specialists. Trainees assemble the Get A Job Kits and send to customers, and receive training on safety in the workplace, conflict resolution, quality assurance and inventory management. Forty graduates have completed the training, with 70% now employed with local businesses. In the first year, 24 graduates sold and shipped 5,000+ Get A Job Kits across the country. For more information: www.getajobkit.com. The award is part of Wells Fargo’s targeted commitment to strengthen communities challenged by the highest levels of unemployment. Wells Fargo awarded $2.3 million to 59 nonprofits across California, Oregon, Washington and Alaska. The organizations offer people advancement opportunities by providing services focused on small- and micro-business development, workforce development and job creation. For more information: www.wellsfargo.com/about/csr. Celebrating its 15th anniversary this year, Women’s Empowerment was recently featured on NBC’s TODAY Show and on CNN.com for offering the most comprehensive job-readiness program in the Sacramento area designed specifically for women who are homeless and their children. The 2014 Organization of the Year has graduated 1,349 homeless women and their 3,500 children. Last year, 93 percent of graduates found homes and 83 percent found jobs or enrolled in school or training. The program combines self-esteem courses, job training, health classes and support services to help homeless women across diverse ages, races and cultures. Women’s Empowerment is funded through private donations from the community and receives no government funding except for in-kind rent from the County of Sacramento. To make a donation: www.womens-empowerment.org. Wells Fargo & Company (NYSE: WFC) is a diversified, community-based financial services company with $1.8 trillion in assets. Founded in 1852 and headquartered in San Francisco, Wells Fargo provides banking, insurance, investments, mortgage, and consumer and commercial finance through 8,800 locations, 13,000 ATMs, and the Internet and mobile banking, and has offices in 36 countries to support customers who conduct business in the global economy. With approximately 269,000 team members, Wells Fargo serves one in three households in the United States. Wells Fargo & Company was ranked number 27 on Fortune’s 2016 rankings of America’s largest corporations. For more information: www.wellsfargo.com.